As much as I enjoy nature waking up after a long winter slumber, there are aspects about spring in California I dread. Tule fog is one of them. It's the implacable ground fog that forms after the state's first heavy rains. It becomes trapped between the mountains in the Great Central Valley, although sometimes you'll even find it drifting into San Francisco and seeping out into the Pacific through the Golden Gate Bridge. Driving in tule fog can feel like a variation of blind man's bluff. There is nothing like a set of red tail lights popping up inches in front of you to give you that heart-leaping-into-your-mouth sensation. Unless you want to talk about reading mysteries or thrillers, of course. Let's consider some good-looking ones coming up. 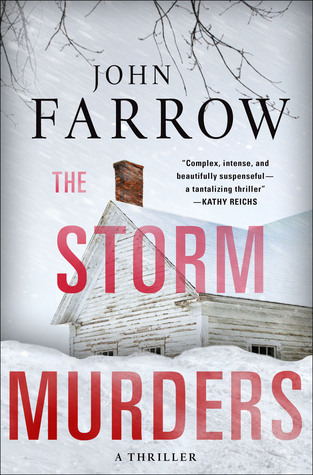 Acclaimed Montreal literary fiction writer Trevor Ferguson writes crime fiction under the pen name John Farrow. His Detective Sergeant Émile Cinq-Mars is an ethical, yet practical French-Indian who combines a Sherlockian mindset with a dogged determination. His sterling arrest record has made him a local legend. We meet Cinq-Mars for the first time in City of Ice, when he investigates the death of an Armenian student, found dressed in a Santa suit on Christmas Eve, hanging from a meat hook with a message to Cinq-Mars around his neck. In The Storm Murders (Minotaur, May 26), the DS is newly retired, and his wife, Sandra, wants him to stay that way. Then an FBI agent asks for help. The murders of a Montreal farm couple, killed after a blizzard, may be connected to similar murders in New Orleans. To make his consultation in New Orleans more palatable to Sandra, Cinq-Mars combines business with a vacation and takes her along. As experienced crime fiction fans, we know this is a recipe for disaster––and Sandra ends up kidnapped. Kirkus Reviews states, "One of the best mysteries from Canada in some time, this fourth book in a strong series is equally good at capturing the atmosphere of New Orleans and the distinctive qualities of Montreal." The madness and tragedy of the Vietnam War have resulted in some outstanding novels. The Sympathizer (Grove, April 1) begins as the Viet Cong take over Saigon in April 1975. It's the first novel written by Viet Thanh Nguyen, an associate professor at USC, who originally came to the United States with his family as Vietnamese refugees in 1975. His writing style has been likened to "Alan Furst meets Elmore Leonard." The book's narrator is a South Vietnamese army captain, whose poor Vietnamese mother raised him in the absence of his French father. After college in the United States, he returned to Southeast Asia to fight in the war. The Captain assists his general in composing a list of those who will board American flights out of Saigon for exile in the United States. There, among a community of exiles trying with varying degrees of success to create new lives in America, the General involves himself with raising money to fund a rebellion back home. The conflicted Captain, who tells us from the beginning, "I am a spy, a sleeper, a spook, a man of two faces," observes this and reports it all to his Viet Cong handlers in Vietnam. I'm usually skeptical about authors' blurbs, but reviewers' remarks about The Sympathizer are in line with those of writer T. C. Boyle: "Magisterial. A disturbing, fascinating and darkly comic take on the fall of Saigon and its aftermath and a powerful examination of guilt and betrayal. 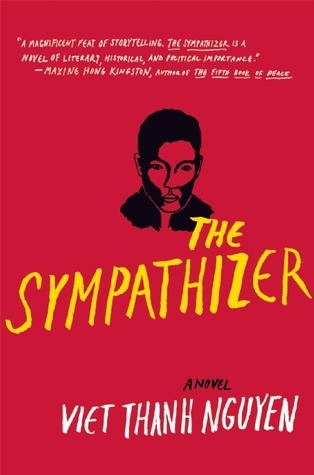 The Sympathizer is destined to become a classic and redefine the way we think about the Vietnam War and what it means to win and to lose." I blinked when I read the comment of Otto Penzler, head of Mysterious Press, about Joyce Carol Oates's Jack of Spades (Mysterious Press, May 5): "This is Joyce Carol Oates at her most diabolical—no small statement." I'll say. Oates is the woman who recalls one of her first childhood stories was Poe's "The Gold-Bug." In a career that has spanned almost 50 years and produced more than 100 books, Oates has written family chronicles, gothic horror, and psychological suspense. A favorite topic is violence and victimization among complex characters living in a rural or small-town setting, where the most common details of everyday life can assume disturbing meanings. Jack of Spades is about a bestselling mystery writer's slide into madness. The writer is Andrew J. Rush, whose 28 tastefully-written books have earned him the reputation as "the gentleman's Stephen King." All seems to be going well for Rush, a model citizen of a small town in New Jersey, until one of his three adult children, Julia, finds a copy of A Kiss Before Killing in his office and questions him about it. Unknown to almost everyone, including his wife, Rush writes a lurid and super-violent series under the pen name "Jack of Spades." Shortly thereafter, a local self-published writer named C. W. Haider, who has a litigious history involving well-known crime-fiction writers, sues Rush for not only pinching her ideas, but actually stealing her work. It may not be a terrible mistake to sue Rush, but it could be a mistake to end all mistakes to sue the Jack of Spades. I have a feeling Oates enjoyed writing this, and it should be a lot of creepy fun to read it. 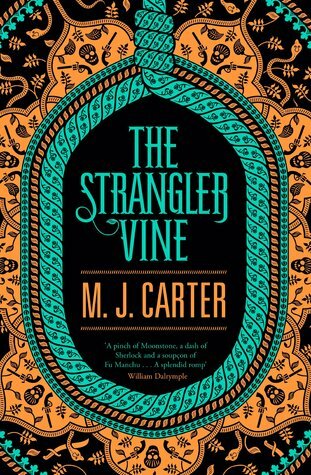 Speaking of creepy fun, I had to investigate when I saw the cover of M. J. Carter's first novel, The Strangler Vine (Putnam, March 31). The title refers to the jungles of India, where creeping vines choke trees until vines and trees are impossible to tell apart. It is into the jungle that novelist Xavier Mountstuart has disappeared after visiting the Honorable East India Company's thuggee department in Calcutta in 1857. The Company is determined to eradicate the thuggees, notorious bandits known for silently strangling their victims. Col. Patrick Buchanan sends Jeremiah Blake, a scholar and Holmesian special inquiry agent, and William Avery, a naive young lieutenant in the Company's army, to find him. This book combines a history of early Victorian India with the derring-do of a couple of mismatched buddies on a quest to find a vanished writer, based on the real-life figure Philip Meadows Taylor, author of the 1839 novel, Confessions of a Thug (see the review of Tabish Khair's The Thing about Thugs here). 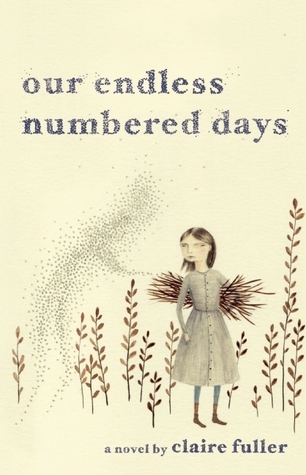 So, tell me, how do you not read Claire Fuller's Our Endless Numbered Days (Tin House, March 17), when advance copy readers rave, warn you to read very carefully and not to read ahead; and Publishers Weekly tells you it has "the winning combination of an unreliable narrator and a shocking ending"? The unreliable narrator is Peggy Hillcoat, who begins her dual-timeframe tale as a 17-year-old in 1985, when she has returned to her mother's home in London. Then we are taken back to 1976 when Peggy is 8-years old and living with her father, James, and Ute, her German concert-pianist mother. James and Ute are ill matched and arguing all the time. Without Ute's knowledge, James, a survivalist, packs Peggy off to a small log cabin in the Dutch forest, far away from everyone, and tells her the Earth's population has been destroyed, and the two of them are the only humans left alive. James and Peggy live off the land, and chapters fill in the story until the two timeframes meet. This sounds like an extremely interesting variation on coming of age in the post-apocalypse.